Breakfast, I had lactose free milk and Nature's Path Slim again. D had the Kashi Meusli. Lunch, D made those wraps again except on the Tapenade one, he added marinated roasted red peppers from a jar. I was thinking of making a wrap but I think I'll try to stick to yogurt for lunch. I feel like I'm carrying a 3 or 4 extra pounds at the moment. Dinner, we made quesadillas. They're super easy and a great way to use veg left in your fridge. In reality, of course, they're a far cry from the simple cheese and tortilla ones. When I first started making them over ten years ago as a fresh out of uni Montrealer, I would use only cheese, mushroom and maybe peppers. A trick I used to do was spice the shredded cheese with the garlic or jalapenos so it was evenly spread and also since in the 'fat', more aromatic. We used whole wheat tortilla and pre shredded Saputo mozzarella as a base. Normally, I would use white cheddar since it's the closest to Mexican. In TexMex cuisine, they'll use Monterey Jack. I think it's a bit salty and sharp but tasty in this type of cooking as well. Mexican cheese is stretchy but not too flavourful which is why I think mild white cheddar works best. D makes his by spread on one Tortilla and folding in half. He made two of these. ADOBO means seasoning I think. We used canned, chipotle peppers in Adobo sauce. There are loads of brands. I bought this from the mexican market on Commercial last fall. It keeps open in a container in the fridge. It is very smokey and mild spicy. Smoked red jalapeño peppers in spices, vinegar, tomato sauce and ancho chiles. 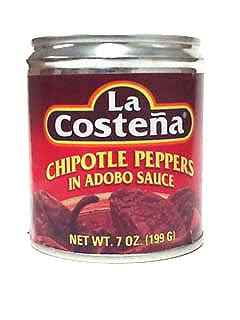 Great La Costena chipotle peppers! (pronounced "chee-POHT-lay"). Smoked red jalapeño peppers in spices, vinegar, tomato sauce and ancho chiles. Great La Costena chipotle peppers! (pronounced "chee-POHT-lay"). I spread my stuff all over one full tortilla and lid it with another tortilla. Put a non-stick skillet on medium high heat. Slide the Quesadilla on to the pan. After 4 minutes, check the bottom to see that's browning. Place a small plate on top (you can use a full plate but it's too heavy for me to do the flipping). Flip the skillet and the plate over and then slide the uncooked side of the quesadilla back onto the skillet and cook until the other side is brown too. Eat with the salsa and avocado's on the side. Slice like a pizza with a big knife. We had some dark Lindt chocolate as dessert. A couple of squares each.